Potentially hundreds of patients have suffered radiation overdoses due to equipment malfunctions or human error involving the use of linear accelerators, a device that uses concentrated, pinpoint radiation to treat tumors and other abnormalities. Generally used to remedy brain and spine ailments with stereotactic radiosurgery, or SRS, the linear accelerators have been found on occasion to leak radiation to healthy tissue, resulting in injuries ranging from loss of balance to patients being left in near-comatose states. If you or a loved one suffered illness or injury following radiation treatment using a linear accelerator, you should call one of our radiation overdose lawyers at 800-243-1100. Many of those cases involved operator error, including the over-radiation of 76 patients in Missouri. 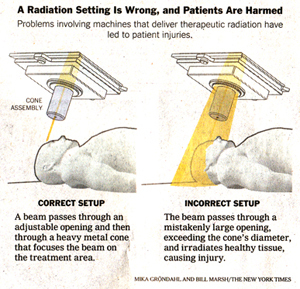 Many hospitals that use the devices retrofit them to deal with specific patient ailments, but in some cases radiation leaks from a heavy metal cone or other attachment and affects healthy parts of the body. The Times article also noted the discovery that 145 patients were affected in a hospital in France because of a calibration problem with a radiation device. In many cases, severe medical ailments as a result of radiation did not occur until many months following the overdoses. Some patients have suffered ailments ranging from difficulty with balance, falling and memory loss to an inability to eat, walk or speak. Nationwide warnings have been issued alerting doctors to be extra vigilant when using linear accelerators to perform SRS. The devices are used for standard radiation therapy but are often redesigned or retrofitted to perform SRS. Kline & Specter, PC, a Philadelphia-based law firm with 30 attorneys, five of whom are also doctors, is among the nation’s top law firms handling both medical malpractice and product liability cases, including litigation involving radiation treatment. Founding partner Tom Kline in 2000 won a substantial settlement in a highly publicized case involving a patient who was left in a near-vegetative state following radiation treatment (See The Phillips Case), while Shanin Specter also has successfully handled several radiation overdose lawsuits. If you have been injured by a radiation overdose, please call one of our experienced attorneys today at 800-243-1100. We represent victims in Philadelphia and throughout Pennsylvania, New Jersey, Delaware and across the US.